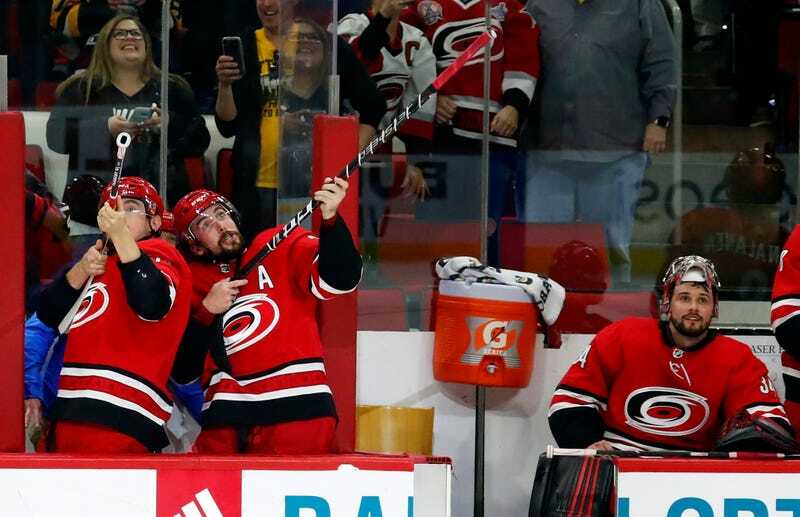 If the season ended today, the Carolina Hurricanes would be in the playoffs—and thank goodness, because this young-but-rising Canes team is easily hockey’s most fun right now. Not just because they’re good (they are) and not just because they’ve rekindled excitement in a town that hasn’t seen the postseason in a decade and forged a genuine connection with their fans (they have). It’s all of it, but to a neutral observer, there’s really no other horse to back if just for the simple reason that you’ll want to see what happens after they win. This year, the Canes have introduced the “Storm Surge,” a choreographed, coordinated team celebration on the ice after every home victory. It’s evolved over the course of the season, and after last night’s 3-2 shootout win over the Penguins, the Canes broke out the most elaborate celly so far, paying homage to Duck Hunt. That’s Micheal Ferland and Justin Faulk gunning down the “ducks”—actually gloves hurled from the bench—and man, this is all so great. Maybe the most encouraging thing about the Storm Surge is how it’s gradually melted the hearts of its critics. This sport is lousy with purity tests, but now only the fuddiest of duddies remain against hockey players visibly having a good time and entertaining their fans.